Whether you call Montreal home for good or home for now, you are welcome to join us! 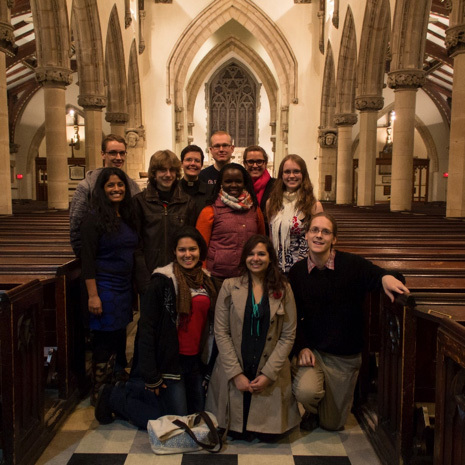 Christ Church Cathedral has a lively community of young adults who are involved in every aspect of our life together. They serve on committees and councils, in worship services, and in ministries of education, hospitality and outreach. Hungry Minds is a very open-ended Bible study in which the conversation begins with the previous Sunday’s scripture readings but ends up in many strange and wonderful places. Questions, doubts, inexplicable experiences, hopes, and dreams all have their place in the conversation. Dinner and more conversation follows. Small faith discussion groups meet regularly and lead worship services together twice a month. For more information on Hungry Minds or other aspects of young adult life at Christ Church Cathedral, or if you are a young adult looking for someone to talk to, please contact the Rev’d Jean-Daniel Williams.